"She is not afraid of the snow for her household, for all her household are clothed in scarlet." 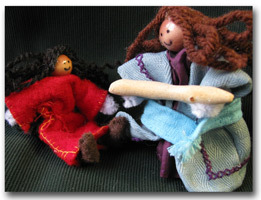 We wanted to give our girls a doll that would encourage them to act out godly themes in their play, and that would help them start to understand the description of a virtuous woman in Proverbs 31. We also want to teach our daughters basic sewing, cooking, and craft skills. 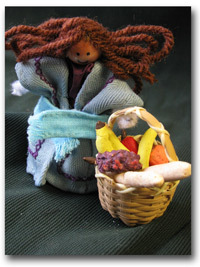 "She is like the merchants' ships; she brings her food from afar.."
As a result, the "Ruby" doll joined our family! 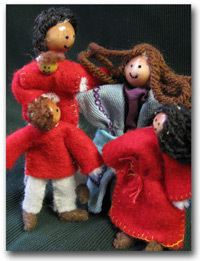 After your daughter brings Ruby to life she can make her a pocket-sized family (we supply enough pipe cleaners and wooden beads for her husband, five children and a baby)! 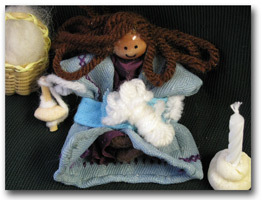 These little dolls can stand up and bend into different positions for hours of creative play. "She considers a field and buys it; with the fruit of her hands she plants a vineyard." A miniature basket filled with real combed wool, a tiny drop spindle, and colorful wool yarn. "The heart of her husband safely trusts in her..."
Instructions offer a choice between beginning and advanced alternatives. Your daughter will practice a rolled hem stitch, running stitch, blanket stitch, simple embroidery stitches, and cutting fabric with a pattern. (Remember -- all these projects are small. Don’t be intimidated!) She will enjoy mixing a batch of modeling clay, the food for Ruby’s shopping basket, baking a batch of yeast bread, and more! 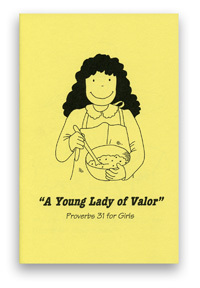 The Young Lady of Valor coloring booklet, with all the text from Proverbs 31:10-31, accompanied by Doorposts-style illustrations. These simple drawings bring each verse down to "girl-level," helping our daughters see practical ways to apply Proverbs 31 to their own young lives. 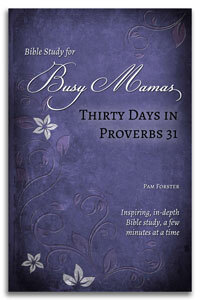 The Virtuous Woman Bible study guide with an overview of Proverbs 31:10-31 and studies on "the law of kindness," "the bread of idleness," and "reaching forth our hands to the needy." "Her lamp does not go out at night. She puts her hands to the distaff, and her hands hold the spindle." Because we are buying materials in quantity, our complete kit can save you money and shopping time. This kit includes everything you need except for glue, scissors, optional paints, permanent marker, and bread ingredients. We provide all fabrics, needles, threads, yarns, birthday candle, wool, baskets, etc. If you have several daughters or want to make more than one Ruby doll, we offer a "materials only" kit that contains all you need to make another set of dolls. 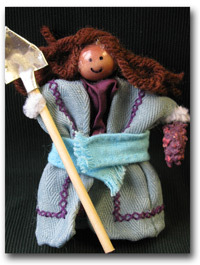 We also offer the option of ordering the Ruby Doll Pattern/Instructions, Young Lady of Valor (Proverbs 31 Illustrated Coloring Booklet), and The Virtuous Woman (Bible Study Guide) separately for those of you who might have a basement full of craft supplies and fabric scraps! "She opens her hand to the poor and reaches out her hands to the needy." Use this as a fun beginning home economics project, Sunday afternoon craft, and mother-daughter Bible study, as you provide your daughters with simple homespun toys! Makes an excellent gift! Also great for a girls’ club project if you buy the pattern and shop for your own materials or buy extra materials kits. Older daughters will also enjoy The Goldie Doll, with more advanced sewing techniques and more in-depth Bible studies on Godly beauty. Caution: This kit contains some small parts. Young children should have adult supervision when assembling their Ruby Doll. This is my third time ordering the Ruby Doll kit, for my third daughter. My older two have loved creating a family-- making, dressing, and naming their characters. We have worked through the Bible study together as well. Most of all, we have loved the time spent together that this kit affords. A wonderful product! 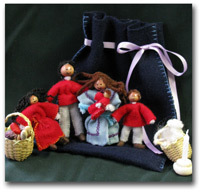 I ordered the Ruby doll kit and an extra set of materials so my two granddaughters could study about a Virtuous Woman and create the dolls and families together. 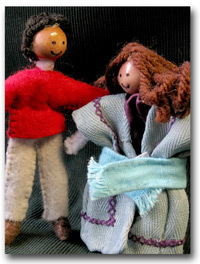 They learned a lot about becoming a godly woman as well as putting some new sewing techniques in practice to create adorable dolls. My daughter and I had hours of fun, while learning the biblical traits of a virtuous woman. She even wanted a doll house for her birthday so that Victor and Ruby can have a home for their family! Such a worthwhile program that will build fond memories for a lifetime! This was my daughter's first sewing project, at age 6, and she had a delightful time with it! Once I had worked with her so she understood the basic techniques, she went on to make plenty of other dolls, animals, cars, clothing, etc. on her own. I highly recommend this product! My daughter, who is 8, has begun assembling Ruby and her family. She is really enjoying the project. The kit contains a dad, mom, and five little children. The kit is put together well. 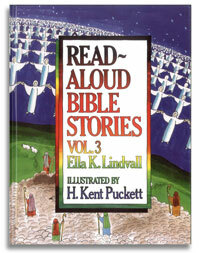 The instructions are well written with easier methods for younger girls and more challenging methods given for older girls. My daughter can't wait to finish and play house with them, and I am happy to see her stitching skills improving. Ruby, the mom, is very small at about 3" tall, so we can't wait to see how tiny the baby ends up! My daughter is really enjoying some special time together when the babies are put to bed and it is teaching her so much. I am surprised she is picking up so much and able to do so much at only 3years old!